We were asked by a large pediatric hospital to create two patches for their kids. One patch was to help reduce anxiety the children might be experiencing pre op and the other was for nausea after surgery. We were beyond honored to be able to do this for the kids. The great thing is that these patches are not just for hospitals or for kids. They are for everyone. There are wonderful advantages for you to have a few in your pocket or pocketbook or book bag. 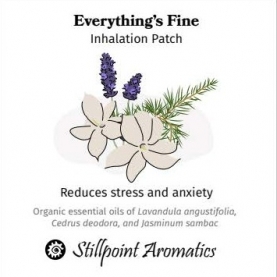 Aromatherapy patches may be a brand new discovery for you but they are awesome especially if you do not like inhalers and they have been around for a long time now. The first patch that we formulated is called Everything’s Fine! Everything’s Fine was created to reduce anxiety, provide strength, courage, to rise above all obstacles, and instill a sense of hope that everything’s really just fine! And it will be! Cedrus deodora– has a sweet, warm woody aroma and when inhaled it brings a sense of calm, grounding, and connection to the majestic conifer tree kingdom. It has a stabilizing effect in the emotional body when someone is over anxious and is experiencing mental hyperactivity. It is a great oil to use when someone is under stress and also feels weak or victimized. Distilled from the heartwood of the Cedar tree this oil connects one to their own heart and unconditional love and the Divine. It also helps stand firm and be solid in their thinking. This is a great 3rd chakra oil which will help connect to your own inner power. Lavandula angustifolia- calms the mind and promotes relaxation and mild euphoria. It acts as an anti-depressant and is effective for people that suffer from anxiety, fear, and panic. Holmes indicates that Lavender reduces limbic system and basal ganglia hyper-functioning and is indicated for hypomania, panic attacks, bipolar disorder, ADHD, depression, phobias, and PTSD. The flowers of lavender are violet which corresponds to the 7th Chakra. This chakra is considered to be the gateway to the soul, so to speak. When this chakra is open and balanced there is a greater acceptance of the good energies that we cannot see. Jasminum sambac - has stimulatory effects on the function of nervous system and inhalation of Jasmine oil affects brain wave activities and mood states. This has been proven in a controlled study which found that the positive emotions including the feeling of well-being, active, fresh and love to have increased and the negative emotions, for example, the feeling of hopeless decreased! Jasminum sambac is a night blooming jasmine and carries the energy of Grandmother Moon. She also connects us to the angelic realm and unconditional self-love. Jasmine is extracted from the little white flower of the Jasmine plant and provides a heart opening effect. She is also a climbing vine and that assists one in climbing out of any situation with ease. The blend contained in each patch was formulated and blended here at Stillpoint Aromatics in our lab. Contain our own (Stillpoint Aromatics) oils and extracts and they are organic, wild harvested or unsprayed. There is no skin contact with the oils. (They are not transdermal). For inhalation only. Which happens to be one of the most powerful ways to use oils to affect the brain and physical body. The adhesive is on the back is a hypoallergenic hydrogel. The delivery is direct and constant and not overwhelming for you or others near you. Last up to eight hours. HOLMES, PETER. AROMATICA: a Clinical Guide to Essential Oil Therapeutics; JESSICA KINGSLEY, 2017. Sayowan, Winai & Siripornpanich, Vorasith & Hongratanaworakit, Tapanee & Kotchabhakdi, Naiphinich & Ruangrungsi, Nijsiri. (2013). The effects of jasmine Oil inhalation on brainwave activities and emotions. Journal of Health Research. 27. 73-77.